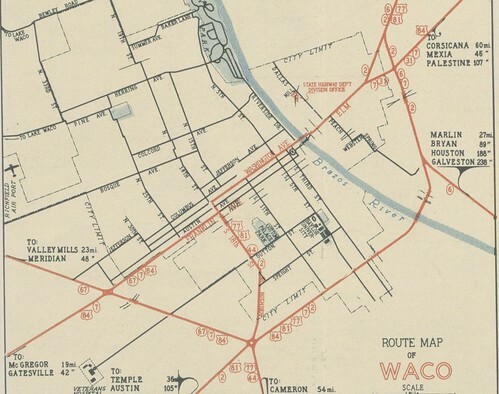 When the US highway numbers were assigned in 1927, US 81 was the only route initially serving Waco. But US 77 soon joined with it, when it was extended down from Dallas in 1933. These routes were concurrent south of Hillsboro, and through Waco they followed New Dallas Highway, Hillsboro Drive, Elm Street, Washington Street, 18th Street, and Circle Road, to the Circle. From there they diverged, with US 77 following Robinson Road, and US 81 following the corridor now occupied by I-35. That was on US 77-81-84, looking northeast on Elm. At this junction US 84 continued straight ahead on Elm (becoming Bellmead Dr), while US 77-81 traffic split off to the left on Hillsboro (becoming New Dallas Hwy). New Dallas Hwy curved to cross the Brazos River, and then connected with LaSalle Av, back to the Circle, where US 77 and US 81 rejoined their original routes. From the Circle, US 84 continued west on Valley Mills Drive to its existing route on Franklin. This would eventually create a higher pool that would inundate the old Valley Mills bridge, so that same year the current SH 6 bridge was completed, and traffic was redirected along the modern corridor. Valley Mills became Spur 396 from the Circle to Waco Drive (US 84). In 1965 the designation was extended out to Bosque Blvd, and then in 1969 it was extended south on Bosque to the new SH 6, thus becoming Loop 396. Meanwhile, in 1965 McLaughlin Road (which formerly carried SH 6 on the west side of the river) was designated as Spur 412. The top overpass is Waco Drive. When that was completed in 1955, US 84 was re-routed to follow its current path through Waco. Since this returned a mainline US highway to the downtown area, apparently it was decided that the US business routes were no longer necessary. US 84's original routing along Bellmead became Spur 299 (but only as far as New Dallas Hwy), and its old route along Franklin became Spur 298 (but only as far as Valley Mills / SH 6). Former US 84 along Franklin between Valley Mills and 18th was turned back to city maintenance, as was most of former US 77-81 / Loop 2 along Washington, Elm, and Hillsboro. Instead, Loop 2 was extended north a couple blocks on 18th, in order to connect with the new US 84 at Waco Drive. In 1959, Loop 232 was created, following what is now Loop 340, from US 84 (Bellmead) to FM 2491 (Elk Road; these are essentially the conditions shown on the 1961 TXDOT map.) In 1960 it was extended down to SH 6 (Marlin Hwy). That same year, Loop 340 was created, running from US 84 in Woodway to US 77 south of the Circle. In 1964 this was extended north to connect with Loop 232, thus eliminating that designation. In 1968 Loop 340 was extended west to FM 3051. ​In 1966, Loop 2 was removed from Circle Road, and instead extended down 18th to LaSalle (US 77-81). This change was a result of I-35 being built through town: since there was no grade separation at Circle Road, Loop 2 had to be re-routed onto a road that did cross the interstate. That was looking roughly east; the campus just beyond the interchange is TXDOT's Waco District headquarters. Clearly Elm and Bellmead were closed during construction, and Elm has never fully regained its functionality as an arterial. Today it is still technically possible to follow the original US 84 by driving northeast on Elm and connecting to Bellmead, but not without passing through a bewildering tangle of overpasses, underpasses, exit ramps, and frontage roads. Circle Road was also impacted. A former arterial carrying north-south highway traffic, it was bisected by I-35, leaving behind two disconnected, seemingly-inexplicable diagonal side streets running through an otherwise gridded road pattern. And south of the Circle itself, the former path of US 81 was completely subsumed by the massive interstate corridor. Taken as a whole, I-35 created a formidable linear barrier through Waco that somewhat isolated the southeast part of town. However, it could be argued (as far as Baylor University is concerned) that this isolation may have turned out to be beneficial, at least in some ways. In 1970, US 77-81 traffic was redirected to use I-35. The old route along the bypass (New Dallas Hwy and LaSalle) became Loop 491, and was signed as Business 77-81 (which was a little strange, since that route was actually built to bypass the central business district). Loop 2 along 18th was truncated to I-35, because the remainder (from I-35 down to LaSalle) became the route for US 77 traffic to exit the freeway and get to the Circle. In 1984, SH 6 was rerouted to follow Loop 340, and its former path connecting with New Dallas Hwy was designated as Loop 484. In 1990 the Loop 491 designation was eliminated; it is now just Business 77. In 1993 the US 81 designation was eliminated south of Ft. Worth, so the original US route through Waco no longer serves the city. In 2000, a massive statewide I-35 expansion project began. In 2010 this project began to impact the Waco area in earnest, as construction got underway to expand the entire freeway between Austin and Hillsboro to at least three lanes in each direction by 2017. While attending Baylor from 1986-1990, the author made frequent roadtrips between Waco and his hometown of Denver, and this was a catalyst that awakened his interest in highways and maps. He went on to a career in cartography, and also put a lot of time into this website, which is focused primarily on the US highway system. In 2012, when his oldest son was considering where to attend college, he expressed interest in Baylor, so they took a roadtrip down to Texas: it was the author's first time back to Waco in over 20 years. His son eventually decided to attend Baylor, which rekindled the author's interest in Waco area highway history, and that in turn is what inspired this webpage. With i35 running through Waco it will only serve to depress property values and quality of life. I suggest Waco move i35 east to 340 and turn i35 through town into a grand boulevard that returns the no man’s land road back to the city and community. Bike paths, tree lined center island crosswalks will also reconnect the divided city.